I have been on the biggest samoa kick lately! Everything about them is heaven. These brownies are nothing short of fabulous. The salted buttercream on top of these rich and fudgey brownies, topped with crisp toasted coconut, chocolate and gooey caramel all combine to perfection. These brownies seriously have it all and you would be crazy not to try them out! 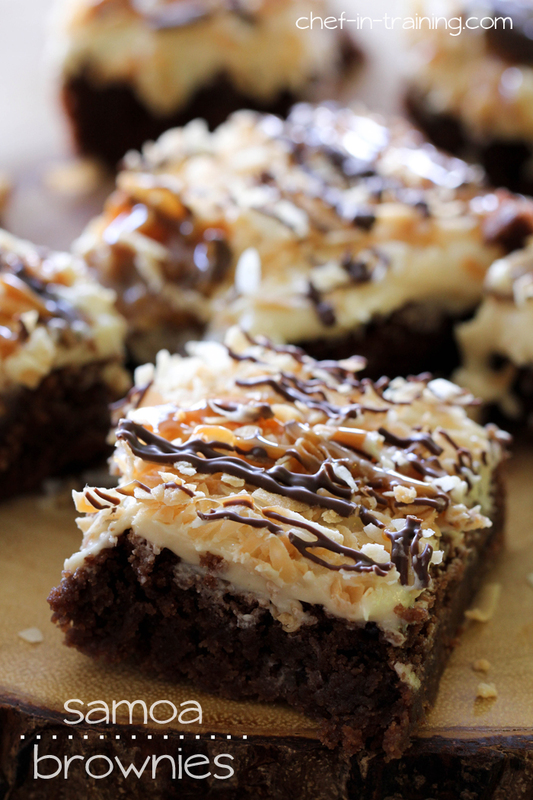 Rich fudgey brownies toped with a delicious salted caramel buttercream, toasted coconut, chocolate and gooey caramel. Cream butter and sugar together. Add eggs and vanilla and blend well. Add salt, cocoa and flour and stir to combine. Don’t overbeat. Pour into a greased 9X13 pan. Bake at 350 F for 20-25 minutes. Let cool completely. Cream butter in stand mixer. Add powdered sugar, salt, vanilla, caramel and milk to stand mixer and mix until well combined. Add more milk and/or powdered sugar as needed to reach desired consistency. Frost the tops of completely cooled brownies. Sprinkle toasted coconut evenly over the top of buttercream. Melt chocolate candy coating in 30 second increments, stirring in between until smooth and melted. Combine caramel bits and water in microwave safe bowl and microwave for 45 seconds. Stir until smooth and well combined. Drizzle melted chocolate candy coating and caramel over toasted coconut. I love Samoas stuff and I know you do too (you have a few other recipes I'm remembering that are Samoas stuff) and these are your best yet! The SALTED CARAMEL BUTTERCREAM. WOW. Pinned! Salted buttercream. Have mercy! Nikki, these brownies have to be the best sounding brownies I've seen in a long time. I love Samoas anything. You won't see me complaining about your samoas kick, my friend. These are a dream come true. All of my favorite things are included. yes, yes, and yes! They look scrumptious! I've pinned them and can't wait to try them! I was thinking of making these this week. I was wondering if there is any reason you couldn't use the caramel ice cream topping to drizzle on top instead of melting the caramel candies? Samoas are my favorite. Definitely need to try these. Thanks Nikki! Samoas are my favorite. These brownies look dangerous. You had me at Salted Caramel Buttercream :) I am a big Samoas fan myself and these brownies are absolutely perfection! Pinned! Oh my good heck! These sound so good. I think I just gained 10 pounds. YUM! My hubby would LOVE these!!! These look amazing! I'm trying them TODAY! I made these last night and the flavor is great but my brownies are on the dry side. What did I do wrong! I don't think I overcooked them as I watched them carefully. Any advice would be appreciated. Can I cheat and use a box of brownie mix to make this even easier? My mouth is watering just thinking about making these! Made these today. Found them a little sweet and had a terrible time cutting them after the caramel hardened. Is there a trick to this? hey, can you tell more about caramel ice cream topping and do you know any brand that sells this in UK. is this a caramel sauce or what? what exactly is candy coating and where can I get this? Also, are the caramel bits sold where the candy section is in the grocery store? These look amazing, must try! By Cocoa, do you mean baking cocoa? Just wanted to clarify. Thanks! I made these and my coworkers loved them!!! I misread the recipe for the brownie though and didn't realize until after I baked the brownie. I was reading as one stick butter rather than one cup. So I only used 1/2 cup butter. I tasted before adding toppings and it worked. And my coworkers loved them ! I have made these several times. I used self rising flour because I like cakier brownies. Cooked about 45 min. I also tried it with coconut oil instead of butter, the consistency was off but it tasted great. Overall it's a favorite recipe thanks. These are the best brownies!! They have the perfect chewiness, the best icing and flavor. I have made these many times for my teenagers and their friends and everyone thinks I'm the best chef :) Thank you for this one!